A newly acquired drone has helped Fauna & Flora International discover important seagrass habitat in Cambodia's Koh Rong Archipelago. Fauna & Flora International (FFI) and partners have discovered a previously undocumented seagrass bed on the east coast of Koh Rong Island, thanks to the acquisition of a brand new conservation drone that is giving the team a fresh new perspective on Cambodia's coastline. This significant discovery has caused much excitement, as seagrasses provide important nursery habitat and feeding grounds for seahorses, sea turtles, dugongs and many other species. They are also home to commercially-important fish and invertebrates which in turn support the livelihoods of the 3,000 people from five fishing communities across the Koh Rong Archipelago. Despite their importance, however, seagrass habitats around the world face many threats including unsustainable development, destructive fishing methods, and pollution. In Cambodia, scientific research into the country's marine environment is still in its infancy, which adds to the challenges of effective marine conservation and management. The drone is a relatively recent addition to the conservation toolkit that allows us to efficiently map large and often inaccessible areas from the sky. In Cambodia, FFI team members and project partners from the Cambodian government's Fisheries Administration are using one to effectively monitor and map mangrove and seagrass habitats, and the results will be used to inform strategic conservation management of Cambodia's marine resources. But despite their growing popularity among the conservation community, drones are easy to crash or damage without adequate training. For this reason, FFI joined forces with Amaury Peeters and Guillaume Bets from Made in Mars to train the team as effective, careful and responsible pilots. By building local capacity through this thorough training, FFI has ensured the effective long-term use of this innovative tool for monitoring and conservation. 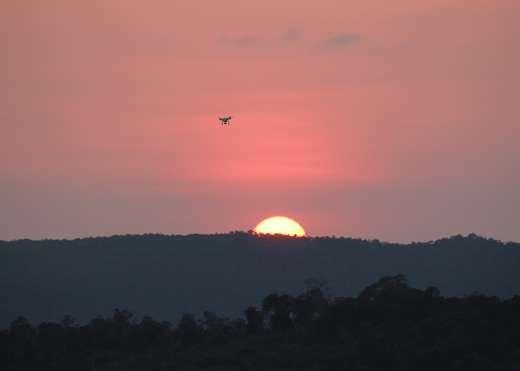 "Flying drones for conservation is important for FFI to help us easily identify and monitor habitats. It will also save survey time and allow us to monitor the exact same areas from the air over many years," said Phalla Leng, Project Coordinator for FFI's Coastal and Marine Conservation Project. "As a researcher, training in this new skill has been really useful – it will help me conduct scoping studies that help prioritise research areas." "Drones are of great benefit to Cambodia, making it easy to create habitat maps and identify areas that need research and protection," said Mr Nhem Vanna, Cambodia's Fisheries Administration. "They will help us to conserve and monitor important habitats such as coral reefs, seagrass, and mangroves. This new technology will save us time while allowing us to conduct new research in Cambodia." Learning how to handle the drone. Credit: Marianne Teoh/FFI. FFI has been working in the Koh Rong Archipelago since 2011 with local communities and the Fisheries Administration to protect coral reefs, mangroves and seagrasses which are vital for the health and productivity of Cambodia's seas, but which are under threat from habitat destruction, poorly planned coastal development, illegal and destructive fishing and pollution. The drone will help FFI design, implement and manage the country's first large-scale marine protected area. Marianne Teoh, consultant for FFI's Coastal and Marine Conservation Project, sees it as an opportunity to put Cambodia's marine environment on the map. "I'm excited," says Marianne. "The images and footage we capture will help us share the beauty and importance of Cambodia's coasts and marine life with both the local and international community, and it will totally change the way we monitor the health of these habitats." 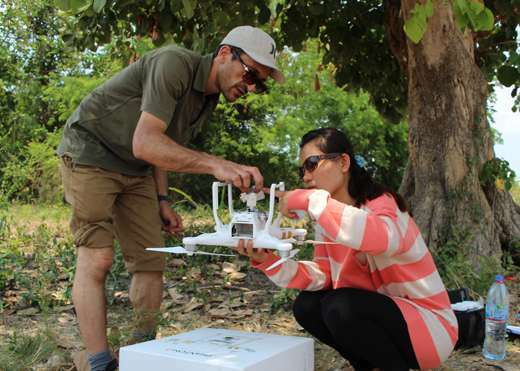 There is also potential for the drone to be used to help the Cambodian Crocodile Conservation Programme team track the population and health of Critically Endangered Siamese crocodiles in areas obscured by tall grasses.